Venu is a technology entrepreneur with track record of successful products at the intersection Big Data, AI and embedded cyber-physical systems. His track record in successful predictive analytics based products include machine learning based product that was acquired by Watchwith/Comcast (https://goo.gl/Xf4PNa), a healthcare asset tracking product at Motorola that led to much of Zigbee, and an AI based network management system for Iridium. His work has been featured in Wired magazine and BBC, and he has been a participant and keynote at the Yankee Group, CES, Digital Hollywood venues, as also past speaker at Iot Slam. He is currently Chief Technologist at next.io, a company developing visual recommenders based on deep learning. He was previously VP of Data Science at Lightpad, a leading consumer IoT startup in intelligent lighting. 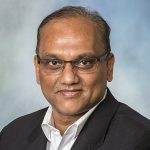 Venu holds a Ph.D. (Databases & Artificial Intelligence) in Computer Science from The Ohio State University, and is an adjunct faculty at Rice University.